Blood flow through the capillary beds is regulated depending on the body’s needs and is directed by nerve and hormone signals. For example, after a large meal, most of the blood is diverted to the stomach by vasodilation of vessels of the digestive system and vasoconstriction of other vessels. During exercise, blood is diverted to the skeletal muscles through vasodilation while blood to the digestive system would be lessened through vasoconstriction. The blood entering some capillary beds is controlled by small muscles, called precapillary sphincters, illustrated in (Figure). If the sphincters are open, the blood will flow into the associated branches of the capillary blood. If all of the sphincters are closed, then the blood will flow directly from the arteriole to the venule through the thoroughfare channel (see (Figure)). These muscles allow the body to precisely control when capillary beds receive blood flow. At any given moment only about 5–10% of our capillary beds actually have blood flowing through them. See the circulatory system’s blood flow. Proteins and other large solutes cannot leave the capillaries. The loss of the watery plasma creates a hyperosmotic solution within the capillaries, especially near the venules. This causes about 85% of the plasma that leaves the capillaries to eventually diffuse back into the capillaries near the venules. The remaining 15% of blood plasma drains out from the interstitial fluid into nearby lymphatic vessels ((Figure)). The fluid in the lymph is similar in composition to the interstitial fluid. 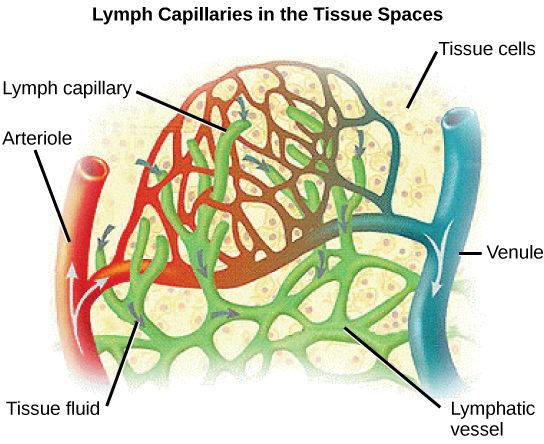 The lymph fluid passes through lymph nodes before it returns to the heart via the vena cava. Lymph nodes are specialized organs that filter the lymph by percolation through a maze of connective tissue filled with white blood cells. The white blood cells remove infectious agents, such as bacteria and viruses, to clean the lymph before it returns to the bloodstream. After it is cleaned, the lymph returns to the heart by the action of smooth muscle pumping, skeletal muscle action, and one-way valves joining the returning blood near the junction of the venae cavae entering the right atrium of the heart. The pressure of the blood flow in the body is produced by the hydrostatic pressure of the fluid (blood) against the walls of the blood vessels. Fluid will move from areas of high to low hydrostatic pressures. In the arteries, the hydrostatic pressure near the heart is very high and blood flows to the arterioles where the rate of flow is slowed by the narrow openings of the arterioles. During systole, when new blood is entering the arteries, the artery walls stretch to accommodate the increase of pressure of the extra blood; during diastole, the walls return to normal because of their elastic properties. 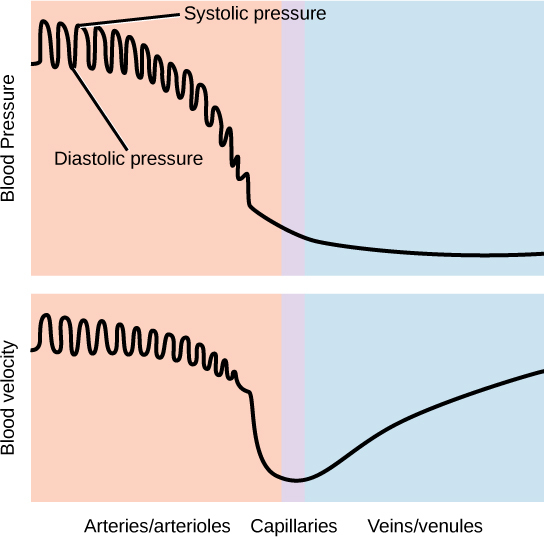 The blood pressure of the systole phase and the diastole phase, graphed in (Figure), gives the two pressure readings for blood pressure. For example, 120/80 indicates a reading of 120 mm Hg during the systole and 80 mm Hg during diastole. Throughout the cardiac cycle, the blood continues to empty into the arterioles at a relatively even rate. This resistance to blood flow is called peripheral resistance. Blood pressure is related to the blood velocity in the arteries and arterioles. In the capillaries and veins, the blood pressure continues to decrease but velocity increases. (Figure) Varicose veins are veins that become enlarged because the valves no longer close properly, allowing blood to flow backward. Varicose veins are often most prominent on the legs. Why do you think this is the case? (Figure) Blood in the legs is farthest away from the heart and has to flow up to reach it. Blood Flow and Blood Pressure Regulation by OpenStax Biology 2nd Edition is licensed under a Creative Commons Attribution 4.0 International License, except where otherwise noted.